The match was played at the home ground of Auckland suburban side Manurewa, with slippery conditions seeing both sides unable to put together smooth play early on. The Falcons started strongly, posting the first goal of the game through Todd Danks. The Falcons worked well in the midfield, with ruckman Louis McLennan winning the majority of taps until forced off with injury, and his replacement Matt Callaghan continuing the dominance. Eventually however, the experience and talent of the Maffra side proved to put a gap between the teams - centre breaks were even at the end of the game, thanks to the Falcons' midfielders, but the scoreboard showed too much knowledge around the ground had let the Eagles run a far more efficient game. In the second half with pressure mounting, the Eagles made the New Zealanders pay for skill errors mounting fast couinter attacks, the game eventually running away from the Falcons. Ex-AFL players Adrian and Hayden Burgiel were best on ground for the Maffra side, kicking 5 and 2 goals respectively, with Andrew Gieschen slotting in three. Best for the Falcons was centre half forward Richard Bradley, their only multiple goal scorer, with half back John Mailing and wingman Dougal Henderson also putting in very strong showings. A promising sign was 18-year-old Alex Fakatoumafia, who with less than a year's experience playing Australian Rules was also among the Falcons' best with a very strong and athletic performance. Maffra were recently named Victorian Country Football Club of the Year by the Victorian Country Football League and have won the past three West Gippland Latrobe Football League premierships. They were chosen by the VCFL to tour to New Zealand for the Falcons to have some match practice before the International Cup and the Falcons players took much valuable experience away from the match. 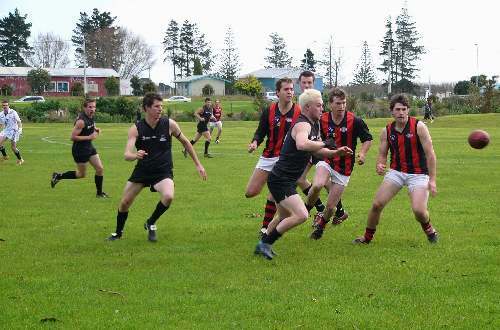 In an interview on the NZAFL website, NZAFL General Manager Rob Malone was reportedly delighted with the entire exercise. "The game was reasonably predictable with the obvious difference in talent, game awareness, overall skill level and understanding of each teamates game being superior with Maffra. I thought the NZ players competed hard, particularly in the last quarter when the game was slipping away from them." "A credit to Maffra as they travelled and presented themselves extremely well. Our boys certainly learnt from the experience and they could see that a number of things they are currently working on was ruthlessly implemented by the Eagles - this was the invaluable lesson". "Its important to put the result into perspective. Most of the Maffra team have been playing together for a number of years and all of the team have grown up playing AFL from the age of 8 or 9. They also had two players, in the Burgiel boys who have actually played at Senior AFL clubs in Hawthorn and Richmond". "The NZ team is full of players who have had limited years actually playing the game and it is an enormous learning curve for them all. For example, Alex Fakatoumafia only picked up a Football in November 2004 and was one of our better players against Maffra with his athletetism and build. He is only 18 and will be so much better in the next year or so". "The NZ group were very positive about the expereince and are looking forward to playing in the International Cup in August". Best: Richard Bradley, John Mailing, Matt Callaghan, Alex Fakatoumafia and Dougal Henderson. Umpires: Stewart Meek (NZ) and George Foggo (Maffra). There was also a short report in the Herald Sun in which New Zealand's Will McKenzie suggested the team would be 25% better for the match. Apparently about 400 spectators turned up which isn't a bad effort considering it probably didn't get much mainstream media coverage. The story says Maffra have won 39 games in a row, so clearly they are a damn good side.